The annexed engraving is a transverse vertical section of a complete melodeon, showing the improvements, lor which a patent was granted to the inventor, A. L. Swan, of Cherry Valley, N. Y, on the 9bh of last March.— One improvement relates to the exhausting bellows, which causes a draught of air through the reed and consists of a new mode of constructing the air receiving box which is in connection with the exhausting bellows. Another improvement relates to a simple qnd convenient mode of working the bellows, by which the player can perform with more ease. By the first improvement, three desirable results are obtained, viz.,the apparatus exhausts nearly double the quantity of air to that of the common exhausting apparatus, and occupies no more space; it also produces a peculiar strong bell tone; and it exhausts with equal pressure at all times, and sustains the power of a note as the apparatus remains exhausting. A-A nptmnBW tMse-fi'iaeleIeon)~Hi-the front part of which, partitioned off by the board, B, running the length of the melodeon; the parts are arranged in the ordinary manner ; G is one of the finger keys; it is shown press-sed down upon the moveable vertical pin a, this acts upon the valve, D, which is shown open; d is one of the reeds; E is a back case or air receiving box ol the instrument. Under the partition, B, there is a passage, b, leading to the valves and reeds ; F is the top of this box, and is connected by wings, c c, to its uppwr edges all around. These wings all fold inwards towards the middle 01 the box, and are of such depth as to allow the top, F, to descend nearly to the bottom of the box ; G is the spring ior forcing up the top, F, and opening or expanding the inside of the box ; H is the valve leading to the exhausting bellows which is the same as in other instruments, having a valve, I. in the lower section. The air is exhausted from the box, E, by the bellows, J, and when the valves, D, are opened, the external air rushing into the box in the direction of the arrows, 1 1, causes the vibration of the reeds, and produces the sounds. In the engraving the box is shown about half exhausted. The force of the spring is strongest when the box is nearly exhausted, and weakest when the top is raised and the box full of air. When the spring is strongest the top would rise quickest and cause the current or air to be the strongest, but this effect is counteracted by the pressure of the atmosphere upon the wings, c c, their tendency to close the box increases with the tendency of the spring to open it, and .this tendency is greatest when the top, F, is lowered, and the box exhausted, and it decreases as the top rises and the box fills with air until when the box is full and the spring exhausted the pressure on the wings ceases. By this means the tendency of the top, F, to rise is always uniform, and the draft or current ol air is always the same until the box is filled. It is this uniformity of draft which is so great a desideratum in instruments of this kind, and which is wanting in the ordinary exhausting apparatus of melodeons. Swan&apos;s Melodeon We will now describe the other improvement for working the bellows with more ease to the operator. L is a treddle jointed at the back end by a pin to a vibrating rod, M, attached to the floor below the instrument ; it is also attached at about the middle depressed by the loot. If the player places his heel on the floor at a suitable distance woortae end of the treddfe, and keeps tip a gentle vibratory motion with his foot, the vibrating bars will be thrown back by thepres-sure and the treddle depressed so as to draw down the moveable section, J, of the bellows, the spring raising it every time the treddle is relieved of the foot pressure. In working a treddle hung in the ordinary way, the curve described by the end of the treddle and by the foot are in opposite directions, aad the foot must slide along part of the treddle. A roller has been applied to the treddle to ease this of its length to a similar vibrating rod, N, which may be of the same length as M. A rod, 0, connects the treddle to the lower section of the bellows. The spring inside ol the bellows always raises the treddle to the position indicated by the dotted lines, until it is motion and reduce the friction, but this is not consideiad-gnod-jilan This improved mode of hanging the treddle causer tte part upon which the foot rests to move in a curve in the same direction as the foot, and the foot remains nearly stationary upon it, the sliding of the foot being entirely obviated, and the necessity for the roller removed. 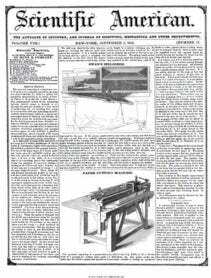 There are two claims in the patent, covering the improvements we have specified, viz., the uniform regulation of the draft of the bellows, and the mode of hanging the treddle. More information may be obtained by letter addressed to the patentee at Cherry Valley.